February | 2012 | Dig Those Groovy Tunes! …I don’t understand why it’s apparently such a scandal that he’s flying the flags at half staff for Whitney Houston. Wait, let me rephrase that: I do understand the concern that the half-staff tradition is technically supposed to be reserved for our servicemen and servicewomen who’ve given their lives for our state and/or country and/or freedom, and that flying the flag at half staff for a mere celebrity sort of trivializes that. That much I understand. What I don’t understand is, why wasn’t everyone all up in arms when Clarence Clemons’s passing was honored in the same manner? Apparently we as citizens of New Jersey are supposed to be absolutely appalled that our governor has chosen to respect the legacy of a — gasp! — drug addict. Won’t someone please, please think of the children?! See, the thing is, we can’t be too sure that no one else for whom the bell tolled flag was lowered has ever had a problem with drugs. If one of our late servicemen/women just happened to have struggled with an addiction at some point in their life before they died heroically, would we give a crap? Would we negate what good they’ve done for their country and their state just because they happened to have moments of weakness that proved them to be less than angelic? Hell no. And let’s just imagine for a second that Clarence Clemons, being the high-profile musician that he is, maybe had a brief period in his career during which he struggled with some addiction or other. Would we suddenly forget that he played a pivotal role in the E-Street Band if we ever discovered that he once had a serious drug problem? I don’t think so. So why do we care that Whitney Houston, another of New Jersey’s undisputed musical gifts to the world, had a long, meticulously documented struggle with drugs? Oh, wait, the answer’s in the question. The difference between Whitney Houston and every other person who ever made a difference in New Jersey is that her weaknesses were publicized about as often as her strengths, and what’s more, they were held under a disproportionate amount of scrutiny. See, the tabloids just love it when talented, successful people — particularly beautiful, talented, successful women — are spotted acting like flawed human beings because it gives them license to twist and embellish the details for their own profit. Really, though, Whitney’s drug addiction is much less relevant to her career and her fame as the trash media wants us to believe. The only reason why we make a big deal about it is because it’s well known, and the only reason why it’s well known is because that’s what all the magazines have been screaming at us while we stand captive in the check-out line at the supermarket, and it’s what the TV’s been telling us while we sit in wait for the actual news, or whatever show’s on next. I’m not saying we shouldn’t care that Whitney had a serious drug problem, just as I don’t think we shouldn’t care if we know for a fact that someone is cutting themself or suffering from an eating disorder. What I am saying is that we shouldn’t act as though Whitney was a horrible person for doing something that — let’s face it — hurt her more than it hurt anyone else. And we certainly shouldn’t make the mistake as defining her as an addict rather than as the superstar she was. I recognize that not everyone is going to be a fan of Whitney Houston’s music, but we should all at least give her the respect of seeing her as an artist and a significant human being before we scrutinize how she may have chosen (or not chosen; felt as though she had to) to spend her personal life. So in short, all I really have to say is this: LEAVE WHITNEY ALOOOOOOONE! Or, as a really smart guy in a book a whole bunch of people have read once said, whoever is without sin, etc., etc. This week’s video is dedicated to my kid brother, who’s celebrating a very special birthday today. Happy b-day, bro! Remember that awful early-Beatles biopic Backbeat that I gave that scathing review of during the early days of this blog? I just found out that Astrid Kirchherr was played by none other than Sheryl “Laura Palmer” Lee. This now means two of my least favorite rock biopics (the other one being The Doors, which is slowly growing on me in spite of itself) feature supporting roles from cast members of my favorite short-lived cult TV show from the early 1990s, Twin Peaks. 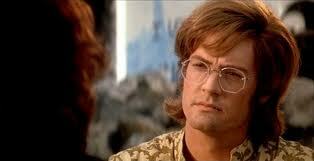 Kyle "Agent Dale Cooper" MacLachlan as Doors Keyboardist Ray Manzarek. One of only two reasons (the other being the Andy Warhol party scene) I find myself watching "The Doors" over and over again. Also the sole reason I managed to sit through "Showgirls" a second time. It’s all a conspiracy, I tells ya. Someone out there wants to convince me to watch terrible movies about awesome bands. Up next, we have the much lesser-known “Friday Night”, which picks up exactly where “I Believe in a Thing Called Love” left off. Having defeated the dreaded Puppet-Cthulhu of Doom, The Darkness now find themselves crash landing in the middle of the ocean on good ol’ planet earth. They eventually find themselves stranded in an episode of The Mighty Boosh (even though this video was made at least a year before “The Nightmare of Milky Joe” aired), where they are pampered by leftover extras from the most recent low-budget, poorly-researched production of South Pacific. I’m not entirely comfortable with the whole appropriation/fetishization/stereotyping of indiginous island women, but otherwise, this video is tons of fun. Particularly the incredibly fake croc/gator that appears during the “Tuesday gymnastics” line. And the Bugs Bunny-type scenario that the band wind up in at the video’s end. And yes, I know the song’s lyrics are quite silly. Until you get to the line towards the end where he sings “‘Cause the way she moves moves me to write bad poetry,” which leads me to believe that’s entirely the point. And anyway, in case you haven’t figured it out yet, The Darkness are kind of a silly band. And somehow that just seems to add to their awesomeness. While “Friday Night” was a direct sequel to “I Believe in a Thing Called Love”, it’s a bit ambiguous where “Growing on Me” fits into the whole space oddysey narrative of the previous two videos. My strongest guess is that it’s a prequel to “I Believe in a Thing Called Love”, in which we get to see how The Darkness were conceived (apparently by pterodactyl-on-spaceship vo-dee-oh-do-do), and apparently hatched out of egg-type-sac-thingies laid by their mothership (haha, get it?! Mothership?!). They grow fast from nearly-pubescent, helicopter-savvy boys to grown men who spend their days frolicking around a mansion in some dimensional intersection of the English countryside (circa 18-something) and fairyland. Also, in case “I Believe in a Thing Called Love” didn’t give you quite enough of Mr. Hawkins prancing around in nothing but a pixel bikini, there’s even more of that in this one. Y’know, if you’re into that kinda thing (like I know I am). Apparently this song is about genital warts. Which I thought was just an immature joke/speculation, but the more I listen to this song, the more I believe it’s true. Whatever. All’s I know is, the song frickin’ rocks.